GermanyWatch: Who Does He Work For? This Thursday, Jeremy Heywood is finally being questioned over 'Plebgate' in front of the Public Administration Committee and will be grilled about the bungled investigation, after CCTV showed that the story about Andrew Mitchell was largely to get him out of the cabinet. Heywood had viewed the CCTV not long after the incident, viewing exhonerating evidence - yet did nothing. This is not Heywood's first rodeo, indeed he is often there in the shadows as pro-British MPs drop like flies. Heywood is the man who really runs Britain. "He needed a trilby and leather coat but there was something of 'Allo ’Allo!’s Herr Flick to the mandarin giving evidence at the Public Accounts Committee one recent afternoon. The PAC is parliament’s prime scrutineer of state spending. Civil servants have it dinned into their skulls to regard it with caution, if not respect. Yet this Herr Flick, with his little sticky-up fringe, his minimalist spectacles, his subtle pouts and sly smiles, conducted himself as a superior mortal. He toyed with the committee. He said he was there as ‘a courtesy’. The MPs should not expect him to make a habit of appearing before them. 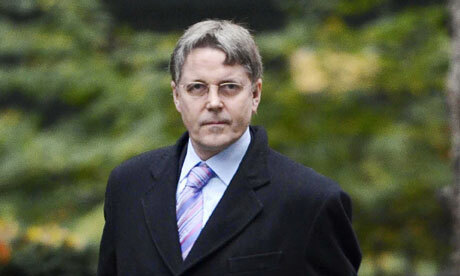 This lean-livered, bloodless Brahmin was Sir Jeremy Heywood, David Cameron’s new Cabinet Secretary. He may long have flown under the radar but he has now acquired such power that public scrutiny is unavoidable. Astonishingly, this was Heywood’s first proper public grilling. To make it to Cabinet Secretary without submitting to this parliamentary wringer is like becoming head chef at the Savoy without ever having cooked quenelles. But Jeremy Heywood is not a front-line Freddie. He has been a Treasury high flier, head of policy at the Cabinet Office, a fixer for prime ministers since John Major. He has never run a big-spending department. Far too exposed. Sir J. Heywood is a backstairs Bertie, a smudger, a whisper-in-the-PM’s-ear sort who shrivels from public view. The worry for Conservatives, and the rest of us, is that this shrewd murmurer, this eminence grease, has acquired unprecedented power over not only the Prime Minister but also Nick Clegg, Cabinet, the coalition and much of the rest of the state apparat. There is talk of Heywood obstructing secretaries of state, shafting Cameroons and organising Downing Street to his own convenience. We have gone beyond ‘Yes, Minister’ and now have ‘Yes, Sir Jeremy’. Worryingly, no one seems more in hock to him than our soigné, someone-take-care-of-that PM. The Cameroons are dying like bees. Andy Coulson is long gone. The Wade-Brookses have also been swept away by Hackgate. Other parts of the Chipping Norton set are in retreat. Steve Hilton is fleeing to California. Heywood’s entry in Who’s Who offers the basics: born 1961 (he is young for a Cabinet Secretary), educated at Bootham School (private, Quaker), married, recreations ‘child-care, modern art, cinema, Manchester United’. That sort of man. His office at No. 10 is decorated by abstract daubs and a bust of Gandhi. After Hertford College, Oxford, the snail trail takes us to the LSE and Harvard Business School. His first job, 1983, was with the Health and Safety Executive. Jeepers. Lord Young, please note. In 1986 Heywood became private secretary to Norman Lamont, Treasury minister. Two years later Heywood was at the World Bank and the IMF (yes, them). In 1991 he became principal private secretary to now Chancellor Lamont. Black Wednesday followed (where the Bundesbank crashed Britain out of the ERM - Was Herr Flick leaking Treasury/BofE plans to the Bundesbank by chance? GermanyWatch) — the first of many shitstorms to occur in Heywood’s wake. Lamont was vapourised and Ken Clarke succeeded to the Treasury. The nimble Heywood survived. Heywood was thought, then, to be on the centre right. How wrong they were. In 1997 he joined No. 10 as private secretary to Tony Blair and soon won the confidence of New Labour, whose key personnel were swift to sniff out Tory fifth columnists. What an amenable fellow Heywood was. He rose as surely as the poolside mercury at Geoffrey Robinson’s Tuscan villa. Mandelson, the Blairs, Jonathan Powell: all were stroked. Heywood had a horse whisperer’s ability to quell and charm thoroughbreds. He knew the words to say. He spoke their lingo. Soon he was on the ‘cc’ list alongside ‘Anji’ and ‘Alastair’ and poor old Philip Gould. One who has seen Heywood in action says: ‘He is remarkably good at sucking up to people without their quite knowing it.’ Heywood oozed. Oiled. Top people said, with admiration, ‘Jeremy knows the system, he’s one of us.’ One of us. What a political phrase that is. There was more elastic in Heywood’s manner than in the late Sir Cyril Smith’s underpants. The convenient lack of official minute-taking in Blair’s inner circle before the Iraq war, exposed by the Hutton Inquiry, was attributed to Heywood. He made himself equally useful when Blair and Gordon Brown were rowing. A more fastidious civil servant might have made his excuses and left. Heywood stayed in the room and soothed the party squabbles. Had he crossed a line? Had he become ‘a player’? In 2004 he joined Morgan Stanley. The City boys were intrigued, wondering what this great political mind could offer them. They soon realised Heywood devoted much of his time to internal politics and had little to say on the major deals of the day. He was, however, the ultimate boss of the team which oversaw the flotation of doomed healthcare company Southern Cross. Come 2007, just before the City collapsed, homing pigeon Heywood fluttered back to Downing Street to steer Gordon Brown to his many successes (sarcasm). David Cameron arrived in 2010. A dangerous moment. Heywood was mottled by the Hutton inquiry and was a relic of a failed regime. But it’s here that he began to demonstrate his quite spectacular survival skills. Heywood speedily made friends with Steve Hilton, assuring the Tory groovemeister how refreshing it was to have a chap pad round Downing Street in bare feet and Big Society T-shirts. So brave! How exciting to be here at this time of change, Steve! Cameron, who likes to think himself a tolerant fellow and sees merit in mercy, was persuaded to retain the services of this most accomplished of courtiers. He made Heywood Permanent Secretary of No. 10. ‘My job is to be focused on making sure the PM is happy hour by hour, day by day,’ said Heywood in a rare interview to a Civil Service magazine. He was ‘overseeing the way in which advice comes to the prime minister’. Kate Fall, Cameron’s actual gatekeeper, must have been thrilled by this news. Promotion to Cabinet Secretary followed on 1 January 2012, and since then two things have happened: David Cameron’s fortunes have plummeted, just as Heywood’s have risen. They could be two cars in a lift shaft. An insider talks of this Cabinet Secretary being ‘an activist’, a contrast to his ideologically light PM. In our constitution is it not meant to be the other way round? Hilton’s resignation has certainly been a boon for our hero — the fruit of a long campaign. In the early months of the Cameron government, as we have seen, Heywood and Hilton struck up an alliance. Every time Hilton vented against the Tory head of the policy unit James O’Shaughnessy, Heywood would agree. He even (discreetly) backed Hilton’s calls for O’Shaughnessy to be dumped. Cameron and his chief of staff Ed Llewellyn were reluctant, presuming that Hilton was merely having one of his occasional bouts of PMT, but eventually O’Shaughnessy’s execution warrant was signed. Shoeless sage Steve thought ‘problem solved’. Wrong! Heywood was two moves ahead. He planted in the PM’s bean the notion that Hilton should not be rewarded for rubbing out O’Shaughnessy. Would it not be wise, Prime Minister, for the policy unit from now to be staffed by Heywood’s civil servants rather than Hilton’s munchkins? Cameron succumbed and the policy unit is now filled with Whitehall conformists who do Heywood’s bidding. Cautious technocrats have seen off the brio boys. Hilton bit at the air in frustration, a bull terrier snapping at bluebottles — and here’s more evidence of Heywood’s genius for manipulation. From early days Heywood had encouraged his friend Steve not to tone down his temper. One of the admirable things about you, Steve, is your passion. That sort of thing. The result? Cameron and Llewellyn would be embarrassed in meetings with civil servants and other outsiders when Hilton went off on one. It was the perfect way of undermining Hilton. With swami Steve now off to the American west, Downing Street’s coast is clear. Heywood has started to overrule Cabinet members, most recently Health Secretary Andrew Lansley — it was Heywood who devised the damaging ‘pause’ in the NHS reforms which allowed the Lib Dems to make so many amendments to the original bill and, along the way, to beat their drums. His old habit of off-piste politicking has returned. When the decision was made to strip banker Fred Goodwin of his knighthood, Heywood it was who squared the supposedly independent honours committee — with such precision that Downing Street briefed journalists on the exact timing of the decision. A tussle over the new permanent secretary at the Education department suggests that Heywood’s writ is running as never before. Samantha Cameron, George Osborne and Hilton all urged Cameron to make an external appointment. Heywood and his sidekick Kerslake — they often ride in to work in the same government car — had another idea. The job went to Chris Wormald, previously ‘director general’ of Nick Clegg’s office. Indeed he is. Much though we mock the Greeks and Italians for being run by unelected technocrats, can we truthfully say that we are any better? " A certain country's top asset in Whitehall? He certainly has the right skills, and is always in the right place at the right time.